A few years ago when i first read somewhere online that in addition to his morning big bowl, Rip Esselstyn often eats a bowl of oats before bed, I felt like I had been given permission to eat more oats. Then I read in a thread on the McDougall discussion board that for some people eating oats at night helps ensure their cholesterol numbers will be lower in the morning. It sounded kind of like knowing how to manipulate the urine sample for a drug test, and it made me laugh. But maybe scrubbing the arteries out with a little oat scrub at night is not such a crazy idea. And if you like oats as much as I do, well, then it’s pretty good news. Still, there are complications. If you need to be gluten-free, be sure to find gluten-free oat products. If oats themselves are too tough for you, then I wish you well in finding a more suitable night time snack. Or should I say dessert. I wanted something a little treat-like I could eat as dessert, but that wouldn’t give me the awful effects regular desserts made with sugar end up delivering. And I wanted something a little bit different than more rolled oats. This interest came about at the same time I began trying to sprout nearly everything in sight, and a Carrie On Vegan post about sprouted oat groat cereal came to mind. 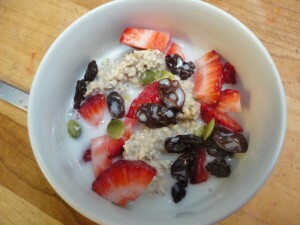 Carrie recommends using raw, gluten-free oats for her recipe, which is a wise choice for many of us. But I remembered that a year ago when Everything Came Up Roses in Portland and I was able to attend the Vida Vegan Conference (where I first heard of Carrie and her blog), my son and (now) daughter-in-law and I made an outing to the Bob’s Red Mill store, where I was treated to a 25 lb bag of gluten free oats. 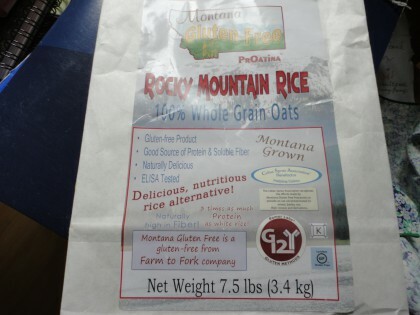 I also picked out a small package of oat groats, since I’d read somewhere on the internet (I think in a fascinating NYT magazine article about gut health research–maybe this one by Michael Pollan) that oat groats are especially good to our guts. But when I got home I realized why the person checking us through had made the peculiar face he made when he rang up this small bag. They weren’t gluten free. Although I am not celiac, I wasn’t sure if I should take the chance, so they sat in my cupboard for a long time. When I’m not sure how to proceed, I use the internet like a big encyclopedia (which is one of the many reason why I am a proponent of net neutrality). I typed in raw oat groats to see what would come up besides Carrie’s recipe, just to give me the lay of oat groat land, and I found Rawfully Tempting’s Fabulous Living Oatmeal. Besides offering an intriguing recipe using raw oat groats, it gives a good explanation of how oat groats are processed and that some are steamed, some have hulls and some don’t. It seems likely that the ones I got at Bob’s were not raw, and thus would not sprout. So using them for Carrie’s recipe was out. But even if they weren’t raw, I could still experiment with using them to make this uncooked oatmeal. And I’m really glad I did. I didn’t notice much trouble, but nevertheless I decided to spring for the raw gluten free ones so I could compare. They are softer, and, for me, a bit easier to digest. I can sprout them if I want. But even though I truly have been sprouting nearly everything in sight, this living oatmeal tastes so good, I still haven’t gotten past using it raw in this recipe. So I’ve yet to discover what the sprouted oat groats taste like. Something to look forward to, when the spirit moves me. Kinda pricey, but the shipping is free. One language oriented caveat from this literal gal, that also leaks a little bit into an ethical sticking point: it seems oddly and perhaps inappropriately funny to me that there is such fine distinction in the Rawfully Tempting recipe about which oat groats are truly living and which are not, when whichever kind you use end up being literally pulverized in the food processor. If they were living before that, I’m hard pressed to see how they could survive such treatment. This contradiction is another one of life’s irritating mysteries concerning how hard it is to be absolute about anything. I tried to get at this impasse in the following sonnet from my chapbook If A Sparrow. By no means do I intend to be making light of my commitment, or anyone else’s commitment, to eat and live in as much harmony with all creatures as possible. It’s just that the road to greater awareness of the consciousness and sensibility of living beings is infinitely complicated. that turns solitude into entropy. with color but keeps the silence with me. such pale grief, its own ghost, haunting my knife. Literally living or not by the time you eat it, this version of oatmeal is delicious. And though I think it’s meant to be a single serving, I like to eat a little bit of it at a time for dessert. The groats, naked or not, raw or not, steamed or not, are even more filling than conventional oatmeal, as is the dried fruit and the few pumpkin seeds. And of course it’s delicious with other fruit, or no nuts or seeds, or different spices. So get curious and see what it’s like to let your oatmeal live. Or at least let you taste buds live it up while you enjoy this unique version of an old classic, and ponder the complexities of ethical awareness. Soak the oat groats in about 3 times their amount in water (so about 3 cups) in a bowl or a quart jar for 24 hours. Drain and rinse thoroughly. Put the soaked oat groats, date paste, almond milk and vanilla in the food processor bowl with the oats. Process until the oats are mostly ground up. Spoon some into a small dish. 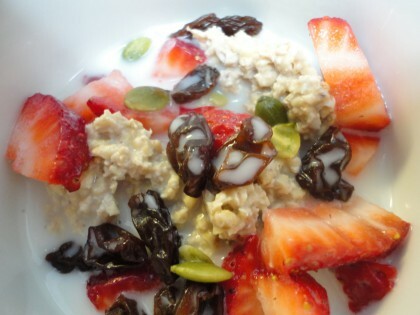 Garnish with cut up strawberry, a sprinkling of raisins, a few pumpkin seeds and an extra splash of almond milk. Carob or chocolate ginger version: Spoon some processed oat groat mixture into a small dish. Add a splash of almond milk. Add a tablespoon or even 2 tablespoons of carob of cocoa powder and a liberal sprinkling of powdered ginger. You can also sprinkle with dehydrated buckwheat groats if you have them. Also excellent with a little orange zest added in. Mix it all together with a spoon until it is a deep carob or chocolate clump. Enjoy every mouthful. If you go check out the Rawfully Tempting recipe, you’ll see that she uses more pumpkin seeds and walnuts, and that she processes the pumpkin seeds with the oat groats together in the food processor, and then adds some of the raisins and walnuts to be processed as well. I wanted a lower fat version with less pulverizing, so I left out the walnuts and just used a few pumpkin seeds as garnish. You could use either one, or both. If you read my blog faithfully, you may have noticed the presence of a few foods that were not on my “Sure Things” list a while back. I’m happy to report that in small amounts, I seem to be able to eat strawberries and even oranges. Haven’t sat down for a big bowl of them together quite yet, but in small amounts among other things, as in this living oatmeal, it’s full steam ahead. I’m very happy about that. I’ve also learned that the buckwheat groats don’t give my gut as much to say if I soak and dehydrate, or soak and sprout them first. With that treatment, they are definitely back on my Sure Things list. It’s a pleasure to welcome these old favorites back into my meals. That poem was lovely! I really enjoy your writing and reading about your thoughts and experiences. This simple dessert looks so fulfilling and nourishing – guilt-free and full of flavor. Just what we’re always looking for! Beautiful poem, Maria! I totally relate to that quality of light being thick as paint!!! Also – you are an oats connoisseur! Mange bien! Yum! That looks delicious! I love groats. Hi Lee–so sorry you can’t eat oats. Here’s an idea: I’ve been toying with trying this with amaranth. I love sprouted amaranth, but it can be a bit tricky to get going. It really goes well with something like carob or even chocolate, so I was thinking of trying to soak it for 24 hours, as I do with the oat groats in this recipe and then just whir it up in the food processor with the other ingredients in place of the oat groats. You could try it with quinoa, too, but I think amaranth has a slightly less grassy taste. If you try it with quinoa, maybe add some banana. I don’t know of any already sprouted brand of these faux grains, but you don’t need to sprout to make this living cereal. Have fun experimenting! Welcome w. 🙂 Oat groats are the whole oat that has not been cut or rolled. You may call them whole oats in the Netherlands. As long as they are whole oats, they should work just fine. Hope that helps. Enjoy! Do I have to soak them for 24 hours? They seem to go off when I wait just a bit to long and I have to throw them away :-(.. So I haven’t been able to try this wonderfull dish.. Welcome, W.–good question. The original recipe I linked to directed a 24 hour soak. But I think it may depend on humidity and temperature where you are, and the condition of the oat groats too. It’s possible at over 24 hours with no rinsing they might start to ferment. Here’s two possible alternatives to try: go for at least 16 hours, so I you don’t get to it right away, you’re still not going over 24. Or if you are going to need to let them soak for 24 (and maybe a little plus) hours, perhaps rinse them about half way through. It’s all a giant “science” experiment and it does make a difference how hot or cold it is, how dry or humid, etc. Hope this helps!